There’s a great little pastry shop/bakery tucked behind a building on Huron Street just on the edge of downtown Ann Arbor. It’s called Decadent Delight. When we stopped in last weekend we were greeted warmly and told that in addition to the lovely pastries and cookies in the case that cinnamon rolls were due out of the oven in about 20 minutes. Oooh, warm cinnamon rolls? It was tempting to wait, but we were still full from that morning’s breakfast so we decided to run a couple of errands and come back to take one home for the next day instead. The cinnamon roll did not disappoint the next morning. It was very tasty and nicely glazed, but not thickly sweet, though I’m sure right out of the oven would have been amazing. I also sampled a creme brulee tart from this visit. The tart shell was exquisite! Great texture, crumb and flavor, but the custard was definitely the star. It was satiny, rich and similar to what you’d expect from traditional creme brulee. 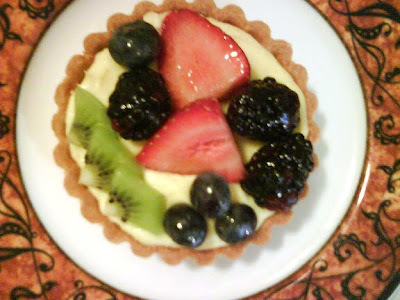 The fruit on top was impeccable, the strawberries, blackberries, blueberries and kiwi were perfectly chosen. A nice balance to the rich filling. This creme brulee tart may have taken the place of my favorite dessert, traditional creme brulee. I’ll definitely have to add this to a list of places to stop at frequently!